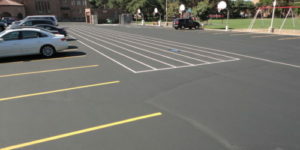 Lake Geneva Tennis Court - Munson, Inc.
from United States Tennis Court and Track Builders Assoc. 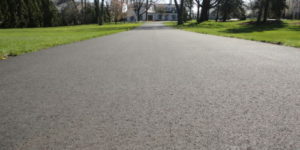 GLENDALE, Wis. – Munson, Inc., a Glendale, Wis. based fencing, paving, and tennis court contractor, received a Concrete Design Award from the Wisconsin Ready Mixed Concrete Association for a tennis court and residential recreational complex near Lake Geneva. 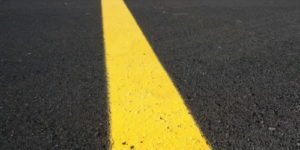 The project received top honors in their category in the competition held by the statewide trade association of ready-mixed concrete producers, and in conjunction with the Wisconsin Chapter of ACI International. Recent previous winners in the same category were the Calatrava addition to The Milwaukee Art Museum and Miller Park. The owners of a Walworth County residence contacted Munson, Inc. wishing to build a tennis court on an adjacent lot. Upon learning site conditions would require the need for a 12-foot high retaining wall to support the tennis court, the owners decided to make good use of the area below the court, and placed a residential recreation center below it. The result: a world-class post-tensioned concrete tennis/basketball court atop a state-of-the-art residential recreation center—complete with a locker room, shower area, weight room, home theater, bathroom, kitchenette, bedroom/office, garage, machine shop and a woodworking room. 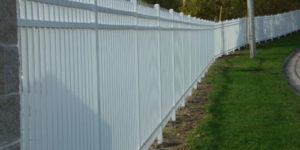 Munson, Inc., was selected for the unique project because they had the expertise to provide turnkey service. 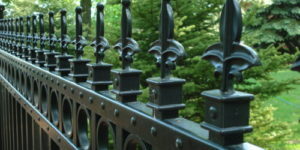 They provided the unique post-tensioned tennis court, black vinyl-coated fencing, and colored/stamped concrete work. As the work expanded into a recreational complex, Munson also ably took over the general contractor responsibilities. Site work and footing and foundation construction began more than a year ago. Spancrete pre-cast flooring was used to cap the foundation. This was then covered with two layers of foam insulation and then coated with commercial roofing materials. Rebar and post-tensioning cables were then positioned prior to the placing of the concrete. 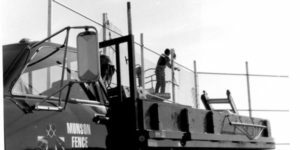 The Munson crew used a job-site telescoping belt conveyor with a 105-foot reach to place concrete for the court from one easy-to-access location. When the concrete was strong enough, the cables were tensioned at 7600 PSI, stressing the concrete to prevent cracking. After the concrete cured, a nine-coat cushion surface, followed by four coatings of acrylic color, was placed over the concrete to finish the court. 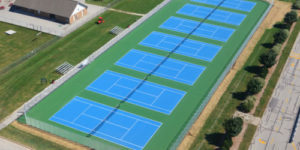 “Munson is proud to be one of the few contractors in the Midwest that build post-tensioned concrete tennis courts. 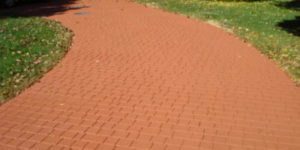 Due to its durability and low maintenance qualities, it is a phenomenal way to build a court,’ adds Kolkmann. If the world-class tennis court and weekend-warrior enviable-recreation center were not enough, the stunning architectural concrete leading into the lower level provided the final touch of excellence. A series of half-circles of colored stamped/concrete surround the entry and garage doors. Hand-seeded exposed aggregate pathways flank the stamped concrete. Colors employed include Victorian Red with a Dark Gray Antique release and Antique White border. The Munson concrete crew formed the intricate design, placing only six cubic yards of concrete at a time to keep the project manageable. In addition to Munson, Inc., the owner, Richard Fisher Architects, Larsen Engineering, Alby Materials and C & H Construction also were honored for their work on the project.